No doubt, strength is a good thing when getting into the garden after winter and taking on spring cleanup and new projects. And if you’re still doing the exercises from ‘Gardener Must-Have: A Strong Back,’ progress is being made. My back is feeling sturdier and now the trick is to keep doing the exercises and not get lax about them. However, it’s not all about strength when it comes to working outdoors. Ever have a day when you have pruned/trimmed so many plants that your thumb joint is sore? Or how about your wrist and forearm after digging with a trowel in clay soil for a few hours? Hamstrings and quads also tighten up with all of the squatting with bent knees. One of the simplest ways to stay limber and reduce the likelihood of these areas tightening up so much they become painful is to STRETCH. When getting back to the garden in the next few weeks, take a few minutes (5-10) before you start working to stretch your best garden ‘tools’ – thumbs, wrists, forearms, hamstrings and quads. They will be much happier for it. 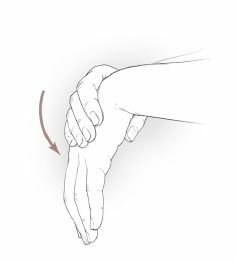 For wrists and forearms an easy stretch is to extend one arm out with palm facing down, put thumb of opposite hand in the crease of wrist and then gently pull down. 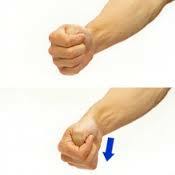 Another stretch for the thumb, wrist and forearm is to bend thumbs inward and cup fingers around them (making a fist with thumbs tucked inside). Now extend arm and gently dip hand down gently. Be gentle and careful not to create pain during the stretch. Hold for 20 seconds and repeat. For hamstrings, there are quite a number of good stretches. Here are some I like. The top photo is called reclined hamstring stretch. Lye down on your back raise one leg as high as possible while keeping pelvis flat on ground and knee straight. Hold the leg and gently encourage it towards your head. Only go as far as to feel a stretch, not discomfort. This can also be done by placing a towel or strap of some sort underneath your foot and using your arms to gently pull the towel or strap towards you. Hold this stretch for 30-45 seconds, keeping your back and head on the ground. Repeat with the opposite leg. The left photo is called tip over tuck hamstring stretch. Stand with your feet hips-width apart. Interlace your fingers behind your back, tuck your chin and bend forward at the hip keeping your knees straight. Hands will gently go over your head. If this stretch becomes to intense release hands and placing them at the back of thighs. Only go as far as you are able with straight knees and no pain. Hold for 30 seconds and engage core to roll up to standing position. Repeat. Standing hamstring stretch is the photo on the right. Find a foot prop lower than your hip and place one heel on it flexing the foot. Balancing on the other leg, keep hips square and bend forward at the hip towards your flexed foot. Hold for 30 seconds and switch legs. For quad stretches click here. The first three stretches shown are very easy to do but I like the kneeling quad stretch for a bit deeper stretch for people with very tight quadriceps. It is nice to have something soft under your knee while doing this stretch so it may be best to do inside. When gardening we are looking to stretch our creativity, our climate boundaries, our dollars etc… but let’s not forget to stretch our body before we get started! Great stretches I will keep in mind and work into my pre-gardening routine….I also get regular massages to help with the soreness. Ooohh…massages sound like a good thing to incorporate! If we follow your advice, we may be gardening into our nineties. You are too funny! But yes, that is the goal!